Looking for the right sewing machine. Is this brothers machine heavy duty enough? link doesn't work but i doubt it. You need to look for a good used commercial machine like consew etc. A regular machine is not powerful enough. You need to go to a sewing machine shop and tell them you want to purchase and old singer machine and have them send it out to be rebuilt to do exactly what you want it to do. They will need samples of the material you will be sewing and thread to. A sewing machine needs to be set up right to do its job. My sewing machine for my business cost me $5000 when all said and done. Dont buy a new plastic light weight Chinese piece of junk. You cant beat an old rebuilt Singer. I'm interested in this as well. I don't want to go in the business just have a project. If your not going in to business then you could probably find something on Craigslist very cheap for hobbies and projects. I went the route I went because I sew hundreds of feet in one sitting. My machine has no bobbins under the machine to constantly refill, it draws from 4 Giant spools of thread. Two go up top and two feed down below. Let me see if I can find a video on Youtube of mine. Consew has done WELL for me...So much so I have 2,an would recommend them. That two-needle Singer 300W205 looks like an incredible machine. Is it possible to sew the two rows at different widths, or just the one shown? What widths are available? Can it also do a single row lockstitch? This is my machine, a new Juki DNU1541S. It has been an outstanding machine and I would recommend this to others. This will punch through the thickest material. The speed adjusts from dead slow to very fast. The method I use for dual rows of stitches is to make two passes using different top stitch walking feet. For my usage this is acceptable. Lots of people use the Sailrite machines, like this Sailrite Ultrafeed LSZ-1 walking foot w/ zig zag. They provide exceptional support! Juki is the one you want. Two thoughts on the subject. My sister bought two commercial machines for a small business several years ago. One was almost new, and had a lot of "features". The other was an old Singer that was from the dark ages, but had been refurbrished. She essentially bought it as a back-up. In reality the old machine became her front line piece. Both because it produced a better more consistant product, and because the new one was constantly broken, or needing constant adjustments. Second - go for it. When I was a kid my best friends parents had a 43' Gulfstar Trawler they bought new. When it came time for replacement canvas (a 43" Gulfstar has a LOT of canvas) the estimates were outrageous. He bought an old Singer machine and taught himself how to sew in his garage. When all was said and done it was beautiful. And because he could do it himself, he made a lot of extra covers and trick canvas that would have cost a fortune to have a canvas shop make. Ended up with the most beautiful boat of its type. We used a portable Husqvarna Viking 6440 sewing machine on our boat rehab. The entire interior, all the drapes, all the exterior vinyl cushions, and all the subrella and clear vinyl. With that same machine, also replaced all the clear vinyl on our 42 Aft Cabin, and a bunch od sewing for the Cougar. Were considering a Juki DNU1541S, but being we do this for ourselves and do not require super-perfection, the Viking did a great job, still works fine, can sew a four layers of upholstery vinyl, and can be replaced with a used one for about $250. If you really want an industrial walking foot machine, do not buy Chinese junk. Japan or German is the only way to go. We have been considering a used Adler walking foot machine and are no longer considering a Juki. An old rebuilt Singer beats new every time. 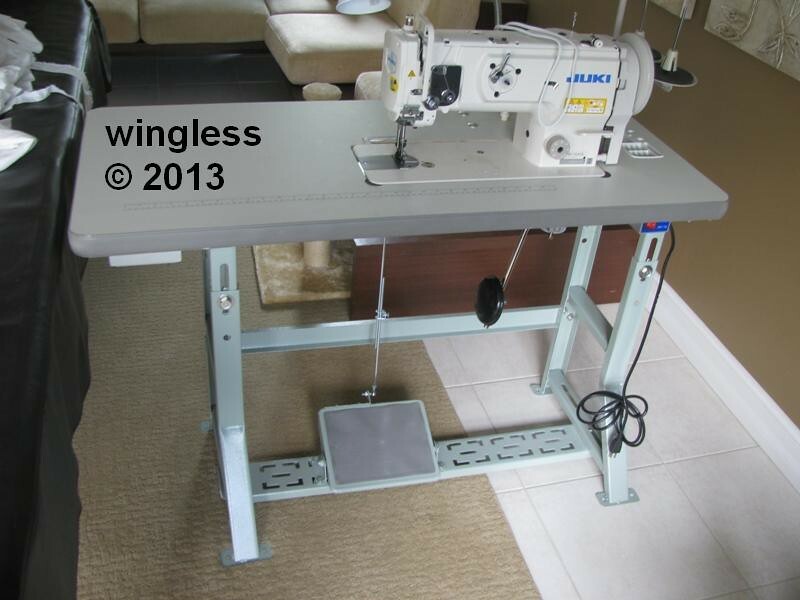 Wingless, yes I can have the machine made to sew any width. Mine does one specific thing so it never needs changed. You can remove one needle and sew with one instead of two. Mine has a binder feed attachment with a big 2" wide roll of binder attached to it that self feeds as I feed my mesh. Great responses! What about particular types of thread that will weather the elements? The PTFE thread, like Gore Tenara, are impervious to sunlight and weather. What do you do, if I could ask? For the singer fans, would an old singer 401a do the job? I have a 50 year old Brother heavy duty portable machine which has done thousands of feet of sewing, mostly 2 to 4 layers of Sunbrella or Dacron sail cloth. No puller but a walking foot. --I have also used an old Singer. I have helped out my sailmaker friends with Consew's and Pfaffs. with the puller and double walking foots. The Sailrite is a good machine, at a decent price. At least go to their web site and look at the videos and articles. Good source of materials. 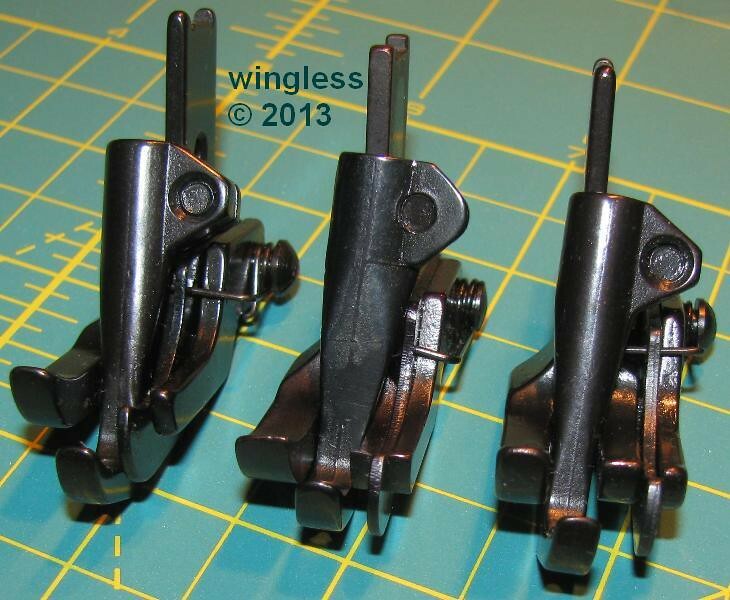 Any machine has to be kept in "tune" and the needs have to be sharp and sized for the thread. A lot depends on how much you have to sew and how many thicknesses there are to sew thru. I use Dacron thread--much cheaper than Tenara, and for inside or sheltered areas is adequate. I use V 69 Polyester Thread, with a #18 to #20 Schmetz needle--depending on the thickness of materials. The Singer 300 looks like a great machine, if you are going to be doing a lot of medium duty work.. One advantage of the larger machines is a deeper throat on the arm, and you can get more rolled or folded material into it, if you have to.